The weaning period when your baby explores other foods and drinks apart from breast milk is one of those earlier phases when he or she learns to be more independent. 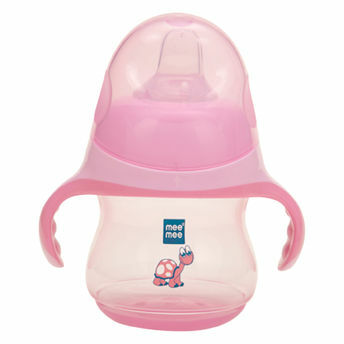 Mee Mee's Bite Resistant Soft Spout Sipper Cup make this stage a joy for both, your baby and you to enjoy. It has soft, smooth, bite-resistant silicone spout which allows liquid to pass through easily when your child sips. The spout is designed is designed keeping your baby's natural mouth cavity in mind, thus making for easy use. The unique non-spill function keeps the liquids inside the bottle even if the bottle is in a slanted or sleeping position. This also makes it ideal for travel and easy to carry in your bag. Always check temperature of food before feeding. Do not microwave. Do not allow your child to crawl, walk or run with the cup. Parental supervision is advised at all times.